Whether playing scenario paintball outdoors or an indoor tournament style game, being able to distract and confuse enemies, communicate with and signal teammates or restrict your opponents vision provides huge tactical advantages. If a sniper has you pinned down, restricting their vision with a cloud of smoke can be great for helping you escape. Sometimes this tactic can be used to effectively draw attention away you and your teammates while under attack, temporarily confusing your enemy. Smoke bombs and paintball grenades are fantastic tools for these tactics and offer tons of other advantages for winning scenario paintball. The best Smoke bombs and hand grenades provide the distraction, cover or signal you need. No matter how a paintball smoke bomb or hand grenade is used the best smoke grenades provide a huge tactical advantage for any paintball team looking to overwhelm their enemy. When purchasing a paintball smoke bomb or hand grenade it is important that it’s not only safe but also works effectively. Beware of homemade smoke bombs and grenades as they can be dangerous and rarely effective. The Rap4 cool burning paintball smoke grenade is by far one of the best smoke grenades on the market taking any scenario or other paintball game to the next level. It is small, lightweight, easy to carry and extremely effective. 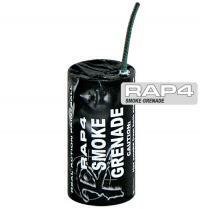 The Rap4 smoke grenade is ignited by lighting a cool burning fuse made of non-hazardous materials and produces bio-degradable, cool burning non-pyrotechnic smoke that can be inhaled without any ill effects. The smoke from a Rap4 smoke bomb is more than thick enough to block the vision of any enemy unfortunate enough to be caught in its vicinity and still remains very safe. After being ignited, the tactical Rap4 smoke grenade will generate 10,000 cubic feet of smoke over a period of 75 seconds! The Rap4 smoke grenade is not only excellent for confusing the enemy by creating a decoy or restricting their vision, it’s also perfect for use as a signal to your teammates. Here at our tactical online paintball supplies store we offer the cool burning Rap4 smoke grenade at the best possible price with prompt affordable shipping and great customer service. At Choicepaintballguns, we make it easy and cheap for you to have the tactical advantage you need to win all your scenario games.